I am on a roll here. 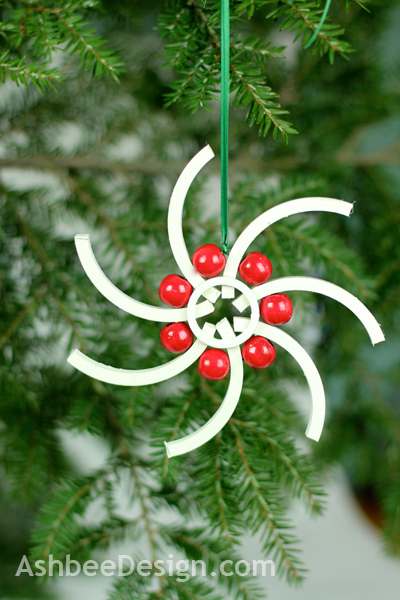 Just like last year with window screen ornament design. 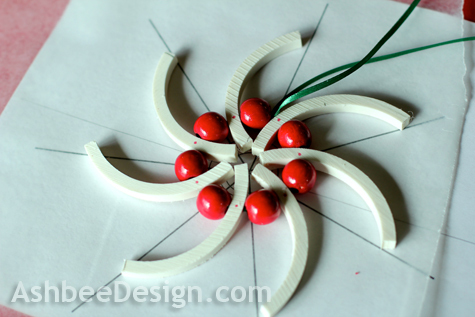 You start by making an ornament, and that leads to another idea, and then another. Next thing you know, it's Valentine's Day and you are still creating new Christmas ornaments. 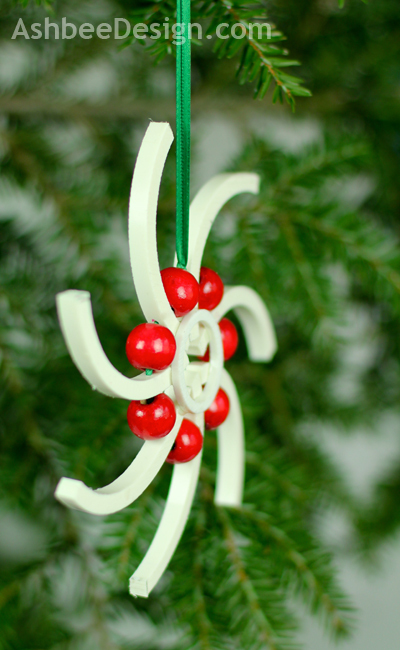 I started with PVC and created the cute little snowmen ornaments. Very easy. But as I considered my collection of PVC scraps, ideas started rolling in. 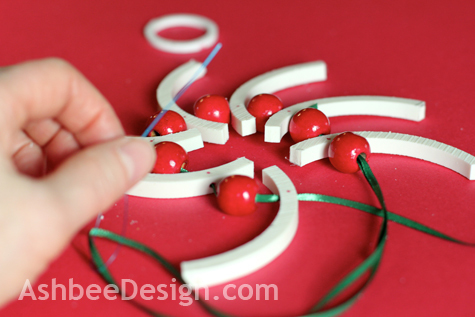 Here is my second idea created using a larger PVC pipe sliced into rings, split and red beads added. I call it Pinwheel PVC. 7 red beads about 1/2" in diameter. I buy the kind used as garland on the tree. 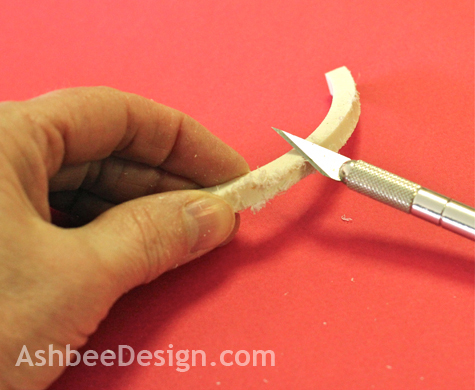 Slice the 3 1/2" PVC into 1"4 thick slices. I did this on a band saw but PVC is relatively easy to cut by hand using a mitre box and saw. Cut each slice into 3 pieces of equal size yielding 9 arcs. You will need 7 for each ornament. Cut the 3/16" ring of off the 1 1/4" pipe. Sand or scrape the plastic fringe off all pieces. Drill a hole through each arc about 3/4" up from one end. 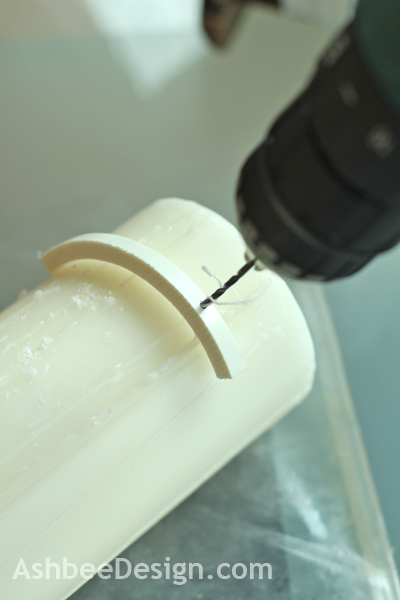 I placed the arc over an old pillar candle to give support as I drilled. 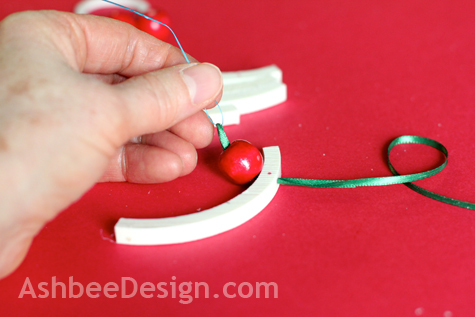 Using a dental floss threader, thread the green ribbon through an arc and then through a bead. Then through another arc, and a bead alternating until you have 7 of each threaded on the ribbon. Tie the ribbon ends together so the circle is tight. I created a template on the computer that was a circle divided into seven equal parts. I made in in Pages and rotated a line 51.4 degrees ( which is 360º divided by 7). 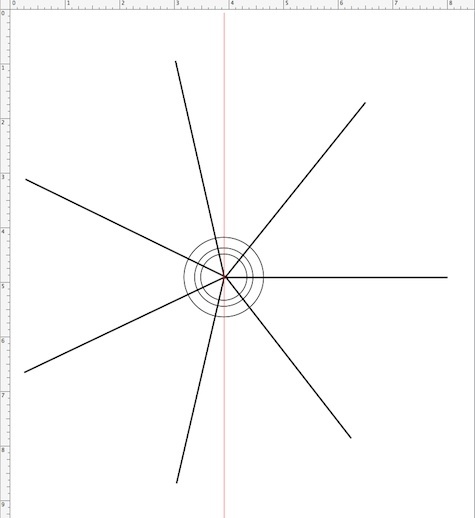 I also drew a few concentric circles in the center to help create a grid. I wanted to line up the arcs in equidistance rays and I knew the bend would create optical illusions. This paper template was to help make things even. I placed the ornament on top of it and arrange the arcs evenly. Note: I chose 7 because I laid out the materials first and determined 7 fit well with the bead size I had randomly chosen. Other numbers can work as well. 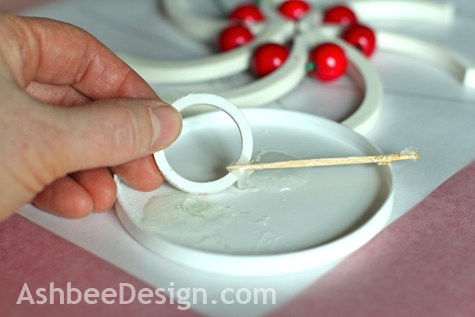 First I tried using 5-minute Epoxy to glue the center ring in place. That worked fine until I dropped the ornament. All the glue seams snapped. I scraped that off and used standard PVC cement. Much better bond. I tied off the top of the green ribbon to create a hanging hook. It is now ready for our tree. Our tree doesn't go up until just before Christmas. This year because Christmas is on a Tuesday and the kids and their families will arrive on the previous Saturday, we will wait until we are together. Our tree is covered with handmade ornaments. It has ornaments David and I made 38 years ago when we were first married. It has ornaments my Mom made which are super special because she started me on my crafting way. It has ornaments the girls made in school or Girl Scouts. It is a tree with a family history hanging from its branches. Whenever the calendar and travel plans allow for it, we wait to decorate the tree together. This year we can. Traditions are so important. It helps provide roots. 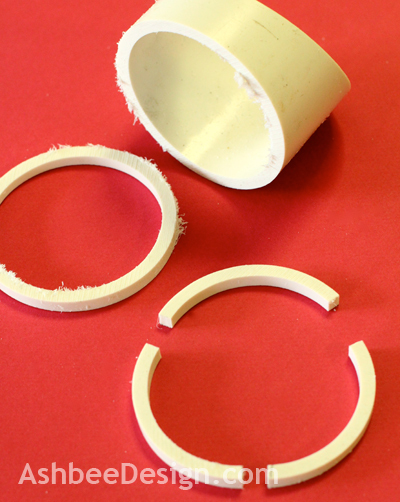 I would never think of pvc pipe as an art supply, but you always have such ingenious ideas. Picking unusual materials helps to get me thinking out of the box! 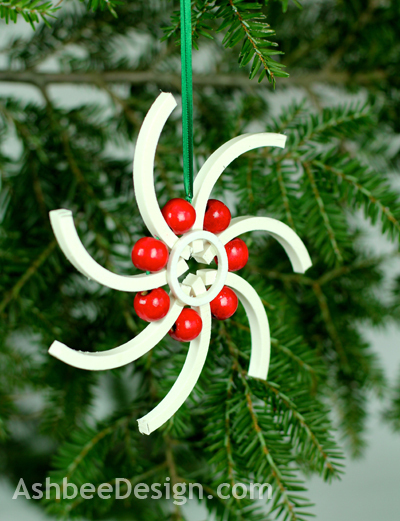 Very nice, gee, I never knew PVC pipe could be cut up and used so creatively!